Ahhh… the sun on my face, the sand between my toes, the soft wind blowing and the distant noises of kids playing combined with seagulls screaming overhead…. 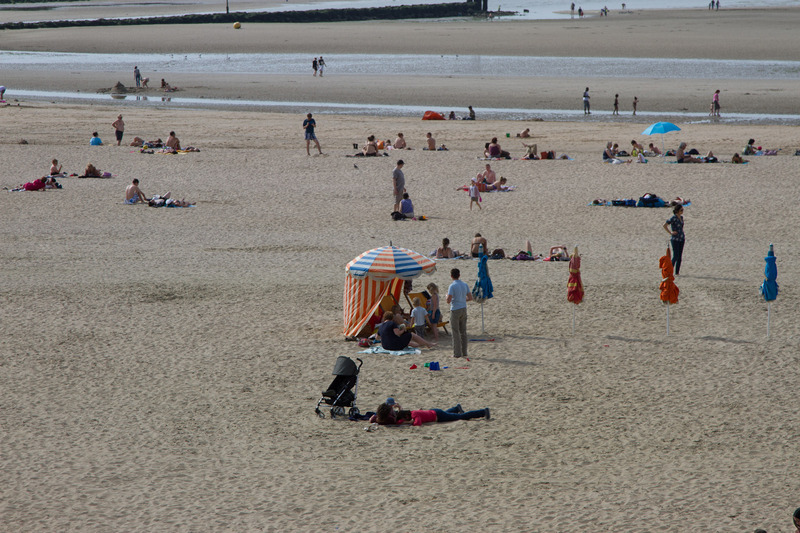 I am sitting in a long chair on a beach in Trouville-Sur-Mer, Normandy, enjoying the sunny day. The weather in Normandy is exactly what people kept telling me it would be: completely unpredictable. This morning was grey and cloudy, and cold. I needed my warmest sweater to go out for a walk. The wind was strong, so much that my hair was always blowing around all over my face like a wild curtain, blocking my view half the time. We considered a picnic on the beach for lunch but eating sand was not appetizing, so we carried our bastognes and salami, cherry tomatoes and baguettes back to our room and ate on our more or less sheltered balcony, overlooking the sea, watching the ships just on the horizon. We talked about how to dress later for our afternoon on the beach, which was going to happen regardless of the weather. Elliot’s main goal that day was to spend all his time digging in the sand with his cousins. Then as we sat there, we started to notice that the dark clouds were being swept slowly away toward the east, being replaced by thin white whisps, and then those blew away like dust and the sky cleared. The bright hot sunshine fell down on us. The light seemed brighter than normal to our startled eyes, it reflected off the sea like a million stars. We grabbed our things, sunscreen, books, beach toys, and ran out the door onto the beach. The beaches in Normandy are amazing. The tides are so extreme that at low tide you have a huge expanse of white sand, so choosing a spot to set up is no problem. We rented one of the local beach tents that are typical of the beaches there, a brightly coloured round tent, open on one side, where you can have some shelter from the dazzling sun or wind if needed. So now I’m sitting here on my long chair enjoying the warmth. I open my eyes and look way out to the sea. There are people jumping over the waves, small dark figures against the sun, and every wave flashes with bright sparkling light, then curls into a white foam and flattens as it slowly rolls in. Yesterday we visited Juno beach, not far from here. It’s where all the Canadian troops landed on June 6th 1944, one of the five beaches that are side by side along this coast, where the D Day landings took place and the liberation of France began. Apparently there were so many ships and smaller boats in the sea, and men and equipment on the beaches that huge traffic jams occurred. Right here, in this sand, where my child runs now, completely oblivious to the literal blood, sweat and tears that were spilled not so many years ago. Every town hall I have passed in this region flies all of the flags of the Allied countries which liberated Normandy after D Day, so it’s pretty cool to see the Canadian flag everywhere. The Canadian cemetery nearby has over 5000 graves, in a picturesque setting on a green hilltop overlooking the sea. There are fresh flowers recently placed in front of several gravestones. Each grave has a soldier’s name on it, his unit, and his age. I didn’t see any over 23 years old. I think about the mothers who lost their sons on that day, and the next several days. The telegram arriving at the door. People feared the postman. A telegram was never good news. It makes me think of receiving CT scan results. The formal piece of paper that reduces your life to a mere statement of facts. Is it possible I can now relate anything back to cancer, or is war an actual valid comparison? I haven’t had lots of time to just sit and think on this vacation, we’ve been busy every day. But right now as we sit on the warm beach in the sunshine, Martin and his sister are chatting, Elliot and his three cousins are digging for lost treasure and I can tune out a bit. The first unit to come ashore lost half it’s men. Their landing had been delayed because of the weather (unpredictable Normandy, time has not changed that), so the tides had risen much more than anticipated. They couldn’t see the hidden mines and obstacles under the water. I look out to the horizon. The tide is coming in now, the beach has narrowed a bit. I imagine watching 14,000 Canadian soldiers, barely more than teenagers, running toward me, stumbling, falling, crawling their way up the beach carrying heavy equipment, or maybe just carrying hope and fear for their their lives. I wonder if it was cold like this morning, if they shivered in their wet uniforms as they struggled up the sand past the dunes, over the rows of barbed wire and into the fields. Or was the sun out by then, mesmerizingly bright, blinding them as they tried to make out friend from foe? Did any of them have time to notice how beautiful the sea looked, or was it too red? I get up from my chair and tell Martin I’m heading back to the hotel for a bit. We’re lucky our hotel is basically right off the beach, just across the boardwalk, so we all make lots of trips back and forth during the afternoon. The receptionist at the hotel does not seem to like this much, each time we have to ask for our key, which is one of those big brass things you could use as a paperweight. The hotel is an old historic building, and since I’m engrossed in WWII thoughts I can’t help but wonder what it was like in those times. Did secret French Résistance meetings take place behind closed doors? I cross the boardwalk, which is littered with Beautiful People, yes, with capital letters. The Parisians are on vacation as of last weekend, and many of them are here. The women sitting at outdoor cafés along the boardwalk all look glamorous, the men all look sophisticated. This despite the constant wind, sometimes gentle, sometimes not, that blows across Normandy. I take the ancient elevator up to our room, it’s one of those old rickety lifts with the second inner door that closes once you’re inside. There is barely enough room for three people in it, much less all the luggage we arrived with yesterday. In our room I glance in the mirror to see how close I am to imitating the BPs, and note with regret that the wind has helped me look very similar to a broom. Oh well. I look out our window and see my family out there, enjoying the day. And yet I still also see all the uniforms running. Who stood here on this balcony on that day? Is cancer like war? A bodily conflict, the chemo and radiotherapy soldiers being sent in to fight off the aggressor, in the hopes a strong strategy and superior numbers will win? The collateral damage is obvious. In France it’s estimated that at least 15 000 French civilians died on D Day, many from the Allied bombings that cleared the way for the troops. Am I being too dark? Thinking of war, a conflict that is caused by people, and comparing it to cancer, an illness which none of us deliberately engages in? Yeah, maybe I am. Oh who am I kidding? In truth I would probably be hiding in a basement, waiting it out. Oh well. We’ll always have Paris.